GARDENA — Jon Shirota, author and playwright, will speak about his new novel, “Ojii-chan’s Memoir,” on Sunday, Dec. 7, at 2 p.m. at Merit Park Recreation Hall, 58 Merit Park Drive, Gardena. The program is presented by the Greater L.A. Chapter of the Japanese American Citizens League. “Ojii-chan’s Memoir” takes place primarily on the tiny island of Ie Jima, off the coast of Okinawa. Ie Jima is where the renowned World War II news correspondent Ernie Pyle was killed. Ojii-chan, who is taken prisoner by the Americans, has discovered that Pyle was loved by everyone. Who dared to kill him? When Ojii-chan discovers that it was he, he is plagued with guilt and self-hatred. The novel also reveals the history of Okinawa (briefly) and a revelation of how the Okinawans survived the Americans’ invasion of their island. Shirota was born in Peahi, Maui, in 1928. His father immigrated to Hawaii from Ginoza Village, Okinawa, in 1907, and his mother immigrated from Kanna Village in 1910. Upon graduating from Brigham Young University in Utah, he worked as a U.S. Treasury agent. In 1963, he was invited to the Handy Writers’ Colony, where he completed “Lucky Come Hawaii,” the first of his novels. 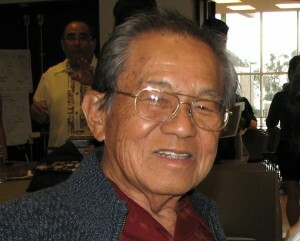 His plays have been produced in Honolulu, Los Angeles, New York, and Tokyo. He has received awards from the Rockefeller Foundation, the American College Theater Festival, the Los Angeles Actors Theater Festival of One Acts, the Los Angeles County Cultural Affairs Department, the Japan-U.S. Friendship Commission, and National Endowment for the Arts.